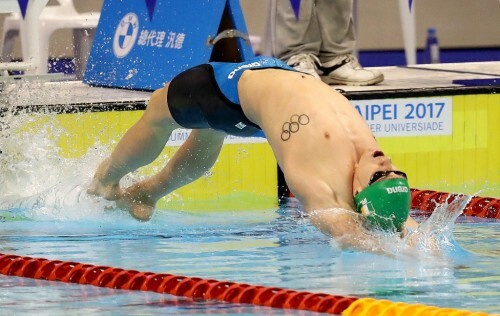 Shane Ryan in action in the heats of the 100m Backstroke in Taipei. Shane Ryan was 0.18 of a second from winning a medal in the final of the Men’s 100m Backstroke final at the World University Games in Taipei City. Ryan who attends Pennsylvania State University swam a very impressive 54.35 in the final but was just tipped off to the bronze medal. Shane is back in the pool tomorrow in the heats of the 50m backstroke.